Ennis erected a House of Industry in around 1775. It was funded by private subscriptions and governed by a corporation under an act of the Irish parliament. It was located at the north side of the town, adjoining the County Infirmary, and contained three male and four female wards. Co. Clare: Bunratty, Clare, Clondagad (2), Clonlea, Cloony, Dysert, Ennis (7), Feenagh, Inagh, Inchacronan (2), Kilconry, Kilkreest, Killoan, Kilmaley (2), Newmarket, Quin (2), Ruann, Templemaley. The Board also included 9 ex-officio Guardians, making a total of 37. The Guardians met each week on Wednesday. The population falling within the union at the 1831 census had been 71,807 ranging from Kilconry (population 2,223) to Ennis itself (14,083). 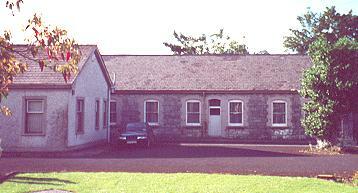 The new workhouse, built in 1839-41, occupied a 6-acre site to the north of the town at Lifford. It was designed to accommodate 800 inmates and its construction cost £6,500 plus £2,100 for fixtures and fittings etc. It was declared fit for the admission of paupers on 1st December 1841 and admitted its first inmates two weeks later on 15th December. The site location and layout are shown on the 1922 map below. The workhouse building followed one of the standard designs by the Poor Law Commission's architect George Wilkinson, with a two-storey entrance block at the south containing administration offices, Guardians' board-room etc. Behind this stood a large three-storey accommodation block, one half of which housed female inmates, the other males. To the rear stood an infirmary block. There is no doubt that the Famine advances upon us with giant strides. The effects of the Famine are discernible everywhere; not a domestic animal to be seen. It is an alarming fact that, this day, in the town of Ennis, there was not a stone of breadstuff of any description to be had on any terms, nor a loaf of bread ...I ventured through the parishes to ascertain the condition of the inhabitants. Although a man not easily moved, I confess myself unmanned by the extent and intensity of suffering I witnessed, more especially the women and little children, crowds of whom were to be seen scattered over the turnip fields, like a flock of famished crows, devouring the raw turnips, mothers half naked, shivering in the snow and sleet, uttering exclamations of despair whilst their children were screaming with hunger. I am a match for anything else I may meet here but this I cannot stand. I have traversed a considerable extent of my district this week and I find distress everywhere on the increase. Without food we cannot last many days longer; the Public Works must fail in keeping the population alive. The workhouse is full, and police are stationed at the doors to keep the numerous applicants out; therefore no relief can be expected from that quarter. In 1847, some minimal relief came in the setting up of Government soup kitchens. However, this scheme lasted only six months and was replaced by a system of discretionary out-relief, which had to be funded by the local poor rate. The demands of coping with the famine, coupled with incompetence and indifference on the part of the Board of Guardians, left the Union with huge debts which amounted to £20,000 by the end of 1849. The consequences of these financial difficulties included local tradesmen refusing supply basic foodstuffs such as Indian meal, or seizing workhouse furniture in lieu of payment. The government finally wrote off the workhouse debts in 1853. At the 1901 census, the population of the Union was 19,772 with 26 officials and 482 inmates in the workhouse. The workhouse later became St Joseph's Hospital. Virtually all the original workhouse buildings have now been demolished, the entrance block surviving until 1970. The only now surviving structure is a former fever ward at the north of the site. Ennis workhouse fever ward from the south, 2000. Sable Wings Over The Land by Ciaran O Murchadha (1998, CLASP Press).